Staging a successful quilt show requires the skills and energy of many people. If you haven't already done so, please complete the quilt show volunteer form by 1 May 2015. Every volunteer will receive a Volunteer Quilt Show badge and a catalogue as a small thank you for the time. Wollongong Modern Quilt Guild require submissions from all Modern Quilters (Members and Non-members) for their upcoming exhibition, by 3rd May 2015. The 2015 Raffle Quilt is a very gorgeous "Swoon" quilt : a current favourite pattern of Modern Quilters around the world. This Raffle Quilt has been made by members of the Wollongong Modern Quilt Guild and monies from the many tickets sure to be sold, will be given to Grand Pacific Health's Suicide Prevention. There is a Children's Modern Quilt Competition, and an Awards Ceremony to look forward to. Registration for their Opening Night Event on Friday 29th May needs to be organised prior to Sunday May 24th, due to catering requirements. Everyone is invited to attend this Quilt Show and vote for their favourite in the Viewers' Choice awards, partake in a Material Obsession workshop, and peruse the fabrics and sewing notions on offer at the various Quilters' Market stalls. 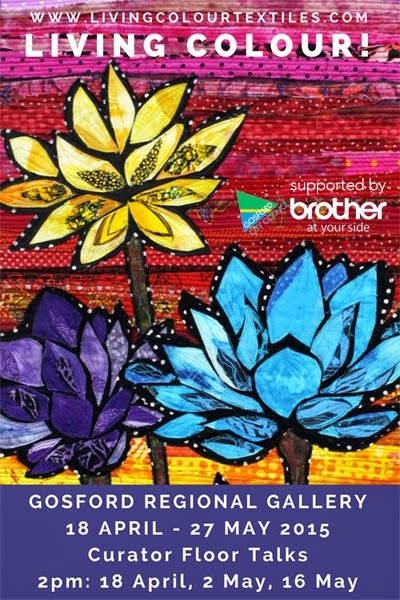 It takes less than 2 hours travelling on the Princes Highway from Sydney, to reach Kiama, so please come and support this vibrant group of quilters at this lovely exhibition on one of the days. Did you know that the effervescent Wendy Williams is a Member of The Quilters' Guild of NSW Inc.? The organisers of Friday Showcase have much pleasure in inviting all members to attend the next gathering to hear Wendy's quilting journey. This will be an opportunity to be absolutely "wowed" by Wendy's masterful approach to colour, attention to stitching detail, and original whimsical designs, as she shares her quilts. Wendy is an extremely popular local and International teacher, author and designer, and business woman. Her quilts are prizewinners, resulting in her designs being enthusiastically embraced by quilters around the world. Her workshops are always full, as she generously imparts the love of applique and stitching that she is known for, so please arrive early for a spot in the Guild's office, as it will be a case of 'hanging from the rafters' for those who are late! Please bring your own mug. Two creative and hard working quilt groups in the state have sent their upcoming Quilt Show information to The Quilters' Guild of NSW Inc.
All members and their friends are invited to attend. Always a colourful adventure to visit new towns and support fellow quilters! Berry is an easy drive from Sydney, Canberra and the South Coast, and as everyone knows a haven for foodies. Members have been making a gorgeous Red and White Raffle quilt, and have organised a show with quilt traders in attendance, and quilting demonstrators to observe. Fancy a road trip to Crescent Head? It is a perfect time of year to enjoy Autumn by the beach. Crescent Head is a 5 hour journey from Sydney, so why not make a weekend of it, enjoy the quilt Show whilst partners and friends can discover the fishing, golfing, birdwatching or whale watching interests, in a location of unspoilt charm. Clyde Street Quilters of Kempsey and Crescent Head Quilters will present their tri annual Quilt show at Crescent Head Public School on the scenic Mid North Coast. There will be a huge display of quilts and wall hangings and some will be available for sale. There will also be craft stalls, book stalls, fabric stalls, Mother’s Day stalls and homemade arts and crafts. Refreshments will be available from the Crescent Head P&C, morning and afternoon teas and lunches will be on sale both days and can be enjoyed in an al fresco setting. Two raffles will be running and there will be hourly draws of lucky door prizes. There really will be something for everyone. 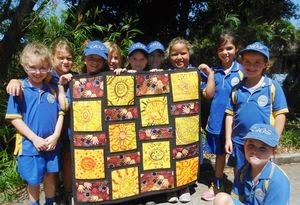 quilts made by the Crescent Head Primary School children. Every child completed a patch which the quilters have turned into works of art ready to be hung on your wall. These original works of art will be up for silent auction over the weekend. Don’t miss out on seeing them and making a bid. All proceeds to Crescent Head Primary School , Crescent Head Preschool and Macleay Hospice. Strip Pieced Quilts : we've all probably tried this type of quilt construction, however it can be argued that the next Guest Speaker for the Quilt Study Group is a maestro at these methods! On the 2nd of May 2015, Trudy Brodie will give a presentation on the versatility of Strip Piecing. She has incorporated this piecing method into many of her quilts, such as Lattice and Log Cabin. These will be featured to show the style of Trudy’s quilts. Quilt Study Group gives attendees the ability to see at first hand a Guest's own quilts, as well as the ability to share their own collection or creations that emulate the style being showcased. Thus please bring along examples of your own strip pieced quilts, such as log cabins, jelly roll quilts, string pieced quilts, etc to share. 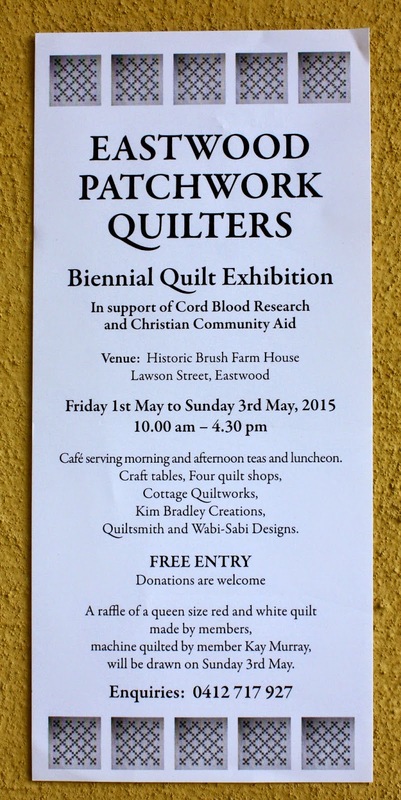 Entry : $5 for Members of The Quilters' Guild of NSW Inc. Need to get out of the house so there aren't any interruptions? Need to visit a Quilt Shop for last minute threads, and / or binding fabric? 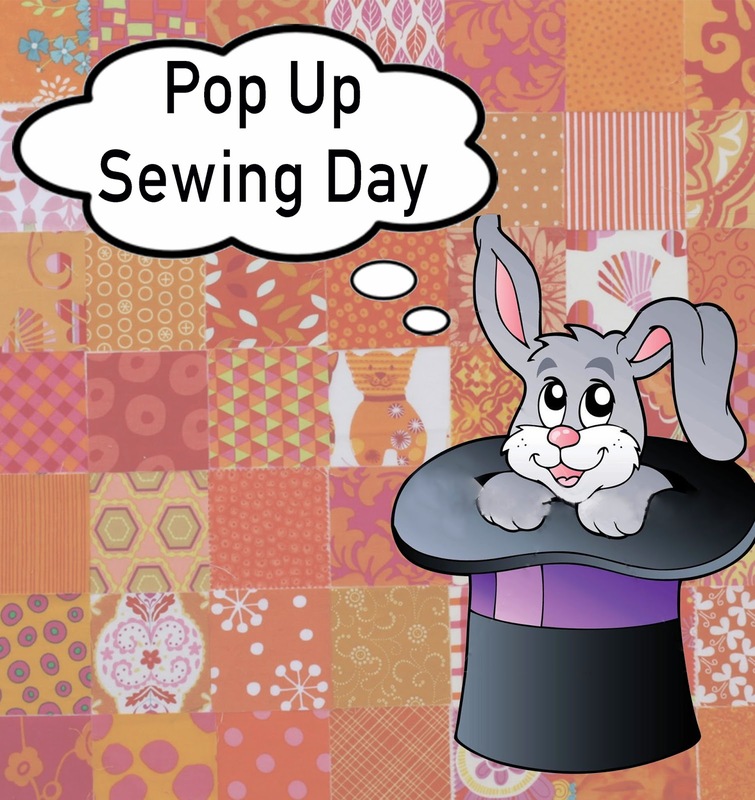 For those who aren't aware, the previous Pop-Up Day needed to be rescheduled, so why not take advantage of this next Pop-Up Day to finish off your Quilt Show Entry. Hobbysew Top Ryde, have "come to the party again" and offer their vast well-lit workspace to Members of The Quilters' Guild of NSW Inc., to enable that last minute dash to the (quilted) finish of your entries. They will also be offering 10% discount on all purchases. Maybe its just your label that needs to be done. Why not come along and enjoy seeing other entries "up close and personal" at this Guild event. Visit the in-store cafe for refreshments, and be inspired for your next quilt, by all of the amazing Hobbysew displays. This glorious queen sized quilt, "Red and White Pinwheels" might become yours if a raffle ticket is purchased at the Biennial Quilt Exhibition being held by Eastwood Patchwork Quilters. Made by members, and beautifully machine quilted by member Kay Murray, this will be the First Prize for the lucky ticket holder. Monies received from the sale of raffle tickets, and profits from the Cafe (serving morning and afternoon teas and lunch,) will support Cord Blood Research and Christian Community Aid. It doesn't seem possible that two years have already passed since the last colourful and creative quilt show was held by Eastwood Patchwork Quilters at Brush Farm House. Once again attendees can expect to see a fabulous display of quilts of all sizes and themes from a very dynamic group. So, please, put this information in your diary now, as attending their 2015 Exhibition will not disappoint! Complementing the exhibition will be the availability of fabrics and sewing 'needs and wants' being offered by Cottage Quiltworks, Kim Bradley Creations, Quiltsmith and Wabi-Sabi Designs. Erica Spinks (BOQ Co-ordinator) has put together a very easy block pattern for members this quarter, and with Sydney Quilt Show Entries probably 'done and dusted' this stress free block could be attended to with one's eyes shut! The Hour Glass block is an extremely common name for a number of quilt blocks, and this month's BOQ is a variation of the Hour Glass, sometimes referred to as Buck-eye Beauty, or, simplified Jacobs Ladder. In fact there are more than 16 names, historically, that have been attributed to the Hour Glass block, extremely simple to both cut and construct. 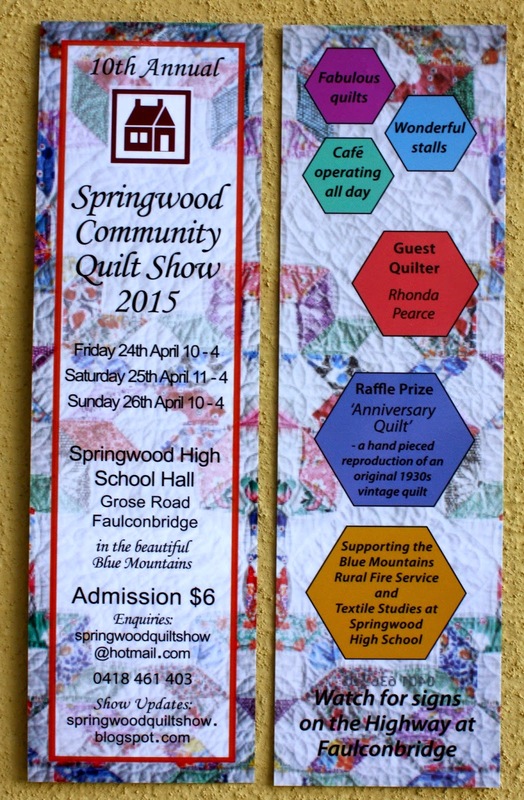 Springwood are celebrating 10 years of Quilt Shows with their upcoming exhibition next week, and in honour of the event, their Raffle Quilt this year is truly gorgeous. The hand pieced design is based on an original vintage 1930's quilt and is made up of typical 30's (reproduction) fabrics. 'Local' Blue Mountains lady, Rhonda Pearce will be featured as Guest Quilter. Most quilters will know of Rhonda as having owned "Post Office Patchwork" in Glenbrook, and those who witnessed the creation of her Baltimore Classic were unsurprised by her 1st Place in the Professional Applique section, and Viewers Choice Awards at the 2013 Houston Quilt Show. Her quilts are a visual delight. Rhonda's Quilt Display will be complemented by the usual fabulous quilt exhibition from local quilters, stalls selling craft goodies, and a cafe stop for those needing refreshments. Please do come to the mountains for a day and support Blue Mountains Rural Fire Service, and Textile Studies at Springwood High School. All will be welcome!